All kids love to draw and paint. It is the supreme outlet of creativity, and there are so many mediums they can choose from, including pens, chalk, paint, markers, and crayons. Rather than making a mess on the table or floor though, why not invest in a art Standing Easel? This convenient easel is two-sided and very easy to clean after the art session is over. 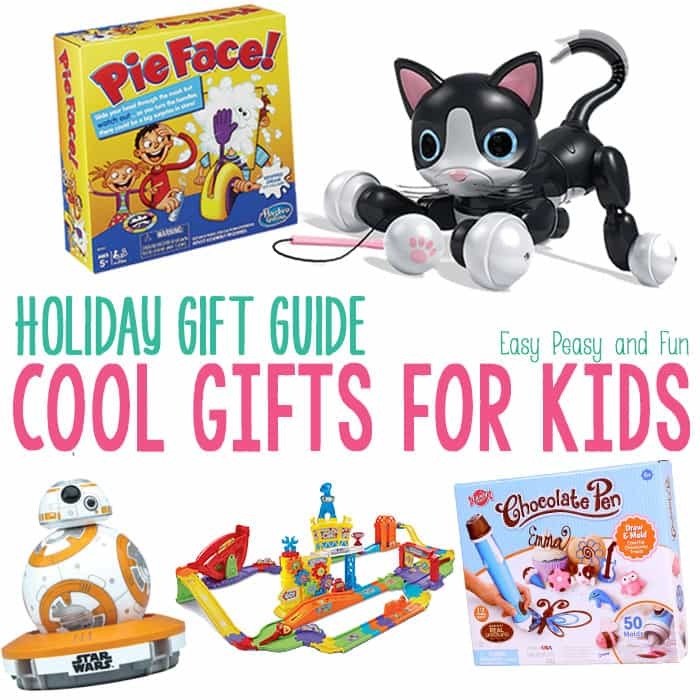 It is educational and enjoyable to use and will appeal to all children. Designed for kids 3 years and over, the Melissa & Doug Deluxe Standing Easel is made of wood and is easy to assemble. You get used butcher’s roll paper, which you buy separately, and pull the paper through on either side of the easel, so there is always a fresh piece for your child to draw or paint on. The easel has sturdy clips which can hold art papers on to the easel, even very large ones. 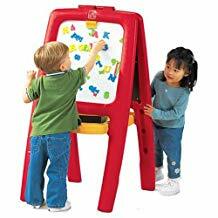 Because this is a two-sided easel, it means that two children can use it simultaneously. One side features a chalkboard, and the other side is a dry-erase board. Those can be used if you do not want to use the butcher’s paper or if your child wants to try another drawing surface. If you do want to use the butcher’s paper option then simply pull it through either side for your child to paint on, then tear it neatly against the easel frame top and set it aside to dry. Pull a new length of butcher’s paper down, all ready for the next picture. This easel stands out because it gets fantastic ratings and reviews from lots of pleased parents. It is high quality and very sturdy. The easel is kid-friendly and colorful. It is also easy to assemble. You can adjust the trays and boards depending on how tall your child is. Although you can get more expensive ones, there is no reason to spend more on an easel because this one offers everything you would want from a child’s easel. It is robust, high quality and very useful. This height-adjustable easel features a double-sided board, trays to keep paints, brushes, chalks, and markers, and a locking paper roll holder with 4 clips on, as well as a child-safe paper cutter at the top. All kids love to paint, and the Melissa & Doug Deluxe Standing Easel is guaranteed to bring out their inner Van Gogh. Set up this easel quickly and fold it flat to store it away. You get 77 magnetic foam letters, signs and numbers to adhere to the magnetic surface and a big paperclip on either side to hold craft paper. The pencil ledges and deep trays will keep markers, pens, chalk, brushes, and erasers within reach and kids will love this fun and versatile easel. Any child between 3 and 6 will enjoy this, and 2 kids can use it at the same time because it is double-sided. The one thing missing is a chalk eraser so you will need to find an old rag or dishcloth to use for that. Apart from that minor point, this is a great easel for toddlers or small children to play with. Working at an easel is educational as well as fun, and drawing with large strokes helps children develop motor development, as well as allowing them to experiment with colors, textures, and shapes. Although a child can paint on paper on the floor or at the table, using an easel means they will not have to reach across awkwardly to reach the whole canvas, board or paper. The artboards and trays on this easel are screwed in place with big plastic knobs which you can loosen or tighten, so the boards are easy to get out and then you can wash them in the sink. Cleanup is very easy with an easel. When painting time is over, fold the easel flat by unscrewing the crossbars and closing the stand, then keep it under the bed, in a closet or against the wall until next time. The 2 plastic storage trays are handy too. One has 4 spaces for paint brushes and paint cups, and the other is a long trough which you can put chalk or pens in. You do not get art supplies with the easel, but you can get the easel companion set separately, which is a variety of art supplies, and the 3-pack of easel paper is also a smart buy. An easel might not guarantee your child’s artwork progresses from the refrigerator to the galleries but it gives kids so much fun and brings out their imaginative side, and that is so important. This easel comes with a sturdy paper cutter, 2 easel clips and a 75′ x 18″ paper roll which will last a long time. The sturdy easel is easy to assemble, and it is very stable. Adjust it up to 48 inches high and enjoy the chalkboard on one side and magnetic wipe-off board on the other side. The molded tray will hold brushes, paints, and cups, and the bin-tray holds other items such as chalks. Collapse the easel for simple storage. This easel won Dr. Toy’s Best Classic Toy Award. The support braces, paper roll bar, and pre-hinged legs are made of hardwood. This is a fantastic buy for any child, and it encourages children to be experimental with painting and drawing. Available in natural wood or white, this kid-friendly easel offers both a whiteboard and a chalkboard. There are handy trays for storing crayons, markers or chalks, as well as a paper dispenser which can be refilled. The 2 anti-spill paint cups are also useful. Kids love art and will spend hours painting and draw on this KidKraft Deluxe Easel. It is easy enough to assemble and sturdy too. This is well-designed, and it should last for years. Your child will love the versatility it offers too and will be keen to make crayon, chalk and marker drawings, as well as using paints and making masterpieces for the refrigerator. Solid hardwood is a fantastic material for easels because it offers stability and will last for years. 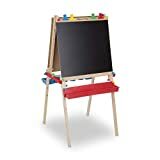 This easel has big trays on both sides, and you can alter the height of the legs so children of various heights can use it and you can adjust it as your child grows up. The baskets offer plenty of storage space for art supplies. 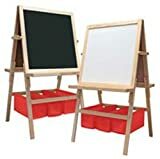 There is a chalkboard on one side and a whiteboard on the other, and there is a hidden paper roll which you can feed over either side of the easel. Of course, you can replace this. Choose this easel if quality matters to you. It is ideal for young artists aged 6 years or over. An easel will allow your child to show off his artistic ability and get creative. Artwork made by children is always so precious, and allowing them to stand up to an easel rather than have to kneel on the floor or reach awkwardly over a table is a great idea because they will have more fun and find the whole process simpler and more comfortable. Child experts claim that kids’ drawings teach them about imagination, self-expression, developing motor skills, and taking pride in their work. A child can draw or paint anything he wants and create his own fantasy lands using some crayons or paints and a blank page. Learning to draw is a special time in a child’s development and all kids enjoy producing artwork. You will need an easel which is the right height for a child, so look at the best kids’ easels, the ones which are the most robust and sturdy. The Melissa & Doug Deluxe Standing Easel is the best easel for kids because it is well designed and fun to use. Having an easel instead of getting your child to use the table also means you can set the easel up by the window to take advantage of the natural light. This minimizes eye strain and keeps your table clear. Also, painting upright instead of at the table means your child will not accidentally smear her work with her palm. Keep plenty of art supplies like different types of paper, paints, and chalks, so your child can play around with different effects. Always praise his work too, telling him how good his drawings are what lovely colors he chose. Display your child’s work in a prominent place like on the refrigerator door, so you can enjoy what he produced and he can take pride in his artwork. Are both sides of Step2 Easel are ok for painting? Yes. You can clip paper for painting to both sides.